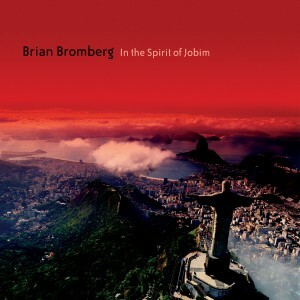 Presented as a simultaneous release with “Bromberg Plays Hendrix”, Brian Bromberg continues to deliver the goods with “In The Spirit of Jobim”. Paying tribute to the great Brazilian Bossa Nova Master, Antonio Jobim, Bromberg offers seven original Jobim inspired songs, alongside five Jobim classics. To stay true to the music, Bromberg has brought together a stellar line up of Brazilian musicians as well as The Rising Sun Orchestra. To further enhance the authenticity, Bromberg had a nylon-stringed acoustic bass made with piccolo tuning to emulate the sound of a nylon string guitar. Don’t let his foray into the higher octaves fool you, Bromberg’s deep, rich upright tones are ever present, steadily holding down the low end. Well produced and filled with breezy, lush arrangements Bromberg truly does manage to capture the spirit of Jobim. One can’t help but feel the depth and thoughtfulness that is put into each track, faithfully delivering Jobim’s original treasures; “One Note Samba”, “Wave”, “Tristefinado”, “Corcovado” and “The Girl From Ipanema” with both style and grace. The additional Bromberg penned tracks, stay true to the genre, capturing the soul of Jobim’s music, once again proving Bromberg’s virtuosity. 10/10. Hot on the heels of Brad Mehldau's Ode (Nonesuch, 2012)—the pianist's first all-original set with his current trio—comes Where Do You Start, culled from the same recording sessions but, with the exception of one Mehldau tune, all cover material. This isn't the first time Mehldau has split a particularly fruitful session down the same compositional line: Anything Goes (Warner Bros.) and House on Hill (Nonesuch) were both same from the same sessions, recorded with original drummer Jorge Rossy before he left the trio to return to Spain. But the two were released two years apart—the cover-song Anything in 2004 and all-original House in 2006—whereas Where Do You Start comes a mere six months after Ode. For some, this kind of accelerated release schedule can be a problem, but if guitarist Bill Frisell has proven anything, with four albums in the space of less than thirty months—from Beautiful Dreamers (Savoy Jazz, 2010) through Floratone II (Savoy Jazz, 2012)—it's that if you've established a strong fan base, you can be more aggressive with your release schedule. Despite being literally a generation apart, Mehldau's similarly rapid ascension—since first appearing in the early 1990s, to a rarefied space occupied, in his case, by living pianists including Keith Jarrett, Chick Corea and Herbie Hancock—has been the direct result of a discography with plenty of hits and really no misses of which to speak. Of course there's a difference when Mehldau, longtime bassist Larry Grenadier and drummer Jeff Ballard tackle cover material rather than a set of originals, although Where Do You Start's eclectic song selection—ranging from well-worn standards like saxophonist Sonny Rollins' "Airegin" (taken at a fast clip, with the familiar melody skewed ever so slightly) to Billy Roberts' near- Jungian hit for Jimi Hendrix, "Hey Joe" (surprisingly literal, even leading to the psychedelic guitar legend's familiar power riff)—provides and encourages the same flexibility and freedom as Mehldau's own writing. The sole Mehldau piece, "Jam," is really just a vamp that is tagged to the end of a gentle reading of Chico Buarque's "Samba E Amor," featuring a lengthy but wonderfully restrained solo that reaffirms the pianist is now in a place where he's nothing left to prove. Of course, Mehldau burns aplenty elsewhere, with the kind of frightening two-hand technique that has distinguished him from so many others. His "Hey Joe" may be relatively faithful, as is "Got Me Wrong," but the Alice in Chains hit provides a chance, in his impressive opening solo, for the pianist to set a very high bar for the rest of the set. From a soft look at Sufjan Stevens' "Holland," that is as much a feature for Grenadier's spare but perfect choices, to a more straight-ahead take on trumpeter Clifford Brown's "Brownie Speaks" (but still, with Mehldau's fugue-like approach), and a particularly lyrical close with the Mandel/Bergman/Bergman title track, Where Do You Start isn't so much an alternative as it is further evidence—as if any were needed—of this tremendous trio's ability to take any material—old, new, borrowed or original—and make it firmly its own. The idea of "jazz composing" can seem a contradiction in terms, since the essence of jazz is improvisation, while composing is by definition planning in advance what music will sound like. Yet Vince Mendoza is very much a jazz composer (in addition to being an arranger and conductor), and Nights on Earth is his first album of original compositions in 13 years, since 1997's Epiphany. Mendoza recorded that album with the London Symphony Orchestra; here, he employs members of the Metropole Orkest on five of 12 tracks, but for the most part, he uses jazz musicians. (Mendoza himself actually performs on only two tracks, playing keyboards on "Shekere" and "The Night We Met.") The album title suggests a lot about the contents, since the reference to night signals that the music is low-key, set at slow tempos as if anticipating the wind-down to sleep (the last track is even called "Lullaby"), and the reference to earth is fulfilled by the world music elements, with styles ranging from South American to African, with instrumentation to match. Mendoza tends to set up a loose musical structure and then bring in a series of soloists to play over it, as he does in "Poem of the Moon," for instance, which has a piano theme played by Kenny Werner, followed by Jim Walker's flute and John Abercrombie's electric guitar. The jazz musicians have a lot of freedom to solo as they please, even as the frame set by the composer contextualizes their efforts. This is particularly striking when Mendoza uses unusual juxtapositions of instruments, such as the bandoneon of Hector del Curto contrasted with Arnaud Sussmann's violin on "Addio." The difficulty in defining the genre of music increases toward the end of the album, with the overt classical influences in "Everything Is You," particularly with Alan Pasqua's piano work, and Fred Sherry's cello solo in "Lullaby." Maybe the overall term must be "jazz" for lack of a better one, but by the end it doesn't really matter, as Mendoza has created his own night-time musical world. Otoño; Poem Of The Moon; Ao Mar; Conchita; The Stars You Saw; Addio; Shekere; Beauty and Sadness; The Night We Met; Gracias; Everything Is You; Lullaby. Vince Mendoza: composer, conductor, arranger, keyboards (7, 9); Lorraine Perry: vocals (10); Luciana Souza: vocals (3); Tom Diakite: kora and vocals (7); Jim Walker: flute (2, 11); Joe Lovano: tenor saxophone (5, 8); Bob Mintzer: tenor saxophone and bass clarinet (3, 11); Stephane Guillaume: tenor and soprano saxophone (4, 7); Ambrose Akinmusire: trumpet (3); Rick Todd: french horn (1, 4, 11); Jim Self: tuba (1, 4); John Abercrombie: electric guitar (2, 5, 8); John Scofield: electric guitar (3, 10); Nguyên Lê: electric guitar (1, 4, 7); Romero Lubambo: acoustic guitar (3); Louis Winsberg: acoustic guitar (1); Alan Pasqua: piano (1, 3, 4, 9, 10, 11); Kenny Werner: piano (2, 5, 8); Larry Goldings: organ (1, 4, 10); Michel Alibo: electric bass (7); Jimmy Johnson: electric bass (1, 3, 4, 9, 10, 11); Christian McBride: acoustic bass (2, 5, 8); Peter Erskine: drums (1, 3, 4, 9, 10, 11); Greg Hutchinson: drums (2, 5, 8); Karim Ziad: drums (7); Alex Acuna: percussion (1, 3, 11); Luis Conte: percussion (4, 9, 10); Christo Cortez: palmas (1); Rhani Krija: percussion ( 7); Miguel Sanchez: palmas and cajon (1); Hector del Curto: bandoneon (6, 9, 12); Marcia Dickstein: harp (2, 11); Andy Narrell: steel drums (4); Jesse Mills: violin (6, 9); Arnaud Sussman: violin (6, 9); Dov Sheindlin: viola (6, 9); Fred Sherry: cello (6, 9, 12); Gregg August: contrabass (6, 9); Judd Miller: synthesizer programming (7, 9); Sarah Koch: concert master (2, 3, 5, 7, 8); Erica Korthals Altes: violin (2, 3, 5, 7, 8); David Peijnenborgh: violin (2, 3, 5, 7, 8); Pauline Terlouw: violin (2, 3, 5, 7, 8); Giles Francis: violin (2, 3, 5, 7, 8); Petra Griffioen: violin (2, 3, 5, 7, 8); Doesjka de Leu: violin (2, 3, 5, 7, 8); Seija Teeuwen: violin (2, 3, 5, 7, 8); Merijn Rombout: violin (2, 3, 5, 7, 8); Herman van Haaren: violin (2, 3, 5, 7, 8); Lucja Domski: violin (2, 3, 5, 7, 8); Wim Kok: violin (2, 3, 5, 7, 8); Elizabeth Liefkes-Cats: violin (2, 3, 5, 7, 8); Marianne van den Heuvel: violin (2, 3, 5, 7, 8); Laurie Vreeken-Bos: violin (2, 3, 5, 7, 8);: Mieke Honingh: viola (2, 3, 5, 7, 8); Norman Jansen: viola (2, 3, 5, 7, 8); Julia Jowet: viola (2, 3, 5, 7, 8); Isabella Petersen: viola (2, 3, 5, 7, 8); Alex Welch: viola (2, 3, 5, 7, 8); Bastiaan van der Werf: cello (2, 3, 5, 7, 8); Maarten Jansen: cello (2, 3, 5, 7, 8); Wim Grin: cello (2, 3, 5, 7, 8); Annie Tangberg: cello (2, 3, 5, 7, 8); Erik Winkelmann: contrabass (2, 3, 5, 7, 8); Arend Liefkes: contrabass (2, 3, 5, 7, 8); Tjerk de Vos: contrabass (2, 3, 5, 7, 8); Eddy Koopman: percussion (2, 3, 5, 7, 8);: Joke Schonewille: harp (2, 3, 5, 7, 8); Hans Vroomans: piano (2, 3, 5, 7, 8). Rain Shadow; What The Waves Brought; The Spinners; Illusion; Samsara; Longing; Carnaval; The Legend of the Moon; Someday My Prince Will Come; Kakavik (The Little Partridge); A Memory That Became A Dream; A Fable; Mother, Where Are You? It's amazing to me that a person so young could write and play music this accomplished. Coming from Cuba, Alfredo Rodriguez plays a wonderful style of jazz with Latin influences. Classically trained, he lays down blazing fast riffs that are complex and extremely well written. However these accolades are the same reasons I take issue with the work. He plays with such intensity and so fast, much of the emotion is lost. The crescendos are muted and there are no soft melodic parts of consequence. Still it's a brilliant effort. I look forward to hearing much more from Alfredo Rodriguez. If you like technically complex music, this is for you. Personnel: Alfredo Rodriguez (piano) Sounds of Space album. Audio Mixers: Dave Way; Cristián Robles; Humberto Gatica Sounds of Space CD music. What A Wonderful Trio ! My first encounter with Tsuyoshi Yamamoto Trio was when I acquired the Trio's Midnight Sugar CD by chance in a Record Shop (La ViVa)in Benoni(South Africa). The CD was recommended to me by the shop owner after I requested him for "something fresh and swinging" - I never regretted the purchase because there is a huge scarcity of Imported CD silmilar to this one and by Asian jazz giants in these shores. I am in fact one of a very few collectors in the country to own these gems of trio swing CD. (I am saying this with my tongue knotted because there may be other collectors in S.A. owning this discs. The crystal clarity sound emitting from this disc is impeccably engineered - a futuristic sound I hope and pray can be heard from all good jazz CDs. I am proud to own this DISC. This explains why extreme high definition is so important - once you've heard it, you cannot go back! sunflower (solo piano); slow blues; obsession; dark eyes - Total running time – 60:22.